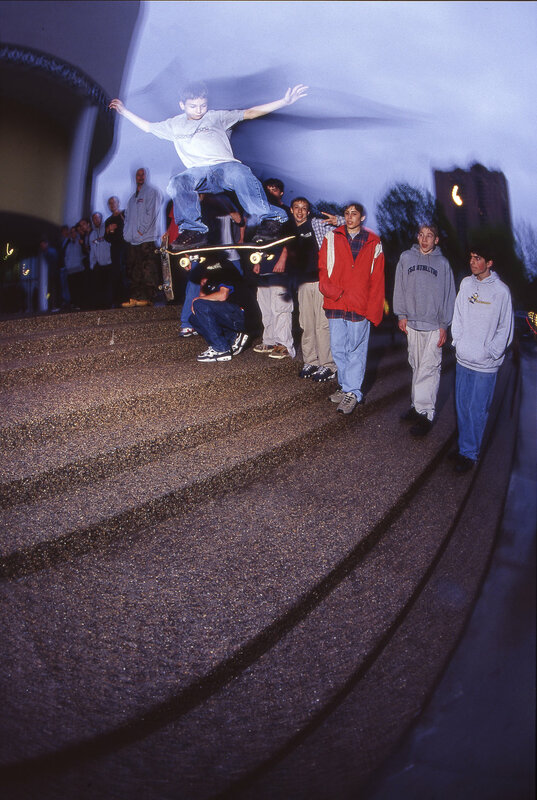 Benji Meyer consistently shared amazing videos throughout the early aughts for the Minnesota skate scene to obsess over, but with the exception of some Consolidated ads here and there, there wasn’t a lot of photo documentation of the local scene at the time. Recently, pictures from the era shot by our friend Damian have been popping up on Instagram, so we asked the man himself if he had more. He said ‘Yes’, sent them over, and once they arrived we were hit with a wild wave of nostalgia – it doesn’t more classic ‘00s Minnesota than Chad Benson in white Kalis 1s and a yellow Supernatural shirt. Ben Ragsdale with a feeble at Ty Dicky Rail when it was still a thread-the-needle situation. Chad Benson backside tailslide at the University of Minnesota. Another Chad Benson backside tailslide, in a another pair of white Kalis’s. Dane Vaughn ollies the triple set at the now-relocated Science Museum of Minnesota. This was at the Real to Reel premiere, and he received a voucher for a free pair of DVS shoes for this ollie. We were so hyped on the voucher. Long before CJ completely destroyed this place, the roofs were definitely Elijah Collard’s spot. Nollie heelflip. Elijah Collard ollies over a bunch of dudes chugging daytime 40s. A very clean cut Brian Heck. VP contributor Mike Munzenrider doing a blunt fakie on a 7.5 board with rolled up jeans and red Royal trucks, very early aughts. We used to skate off the side of this bump. I remember someone saying Steve Nesser went over the pole and I was convinced I was being lied to – apparently not. Backside 180. Steve Nesser 50-50 at the Farmers Market. Shout out to Speed Metal bearings. Steve Nesser riding a full pipe at night. Emeric ‘Olu’ Pratt has always thought outside of the box. 50-50 up and in. Olu backside nosegrind in Chicago. Ben Ragsdale is one of the smoothest skateboarders to ever come from Minnesota. Backside kickflip. Shoveling out spots is so Minnesotan. Seth McCallum crooks. Not sure if anyone skated this spot before or after this went down. Elijah Collard backside nosegrind. Neal Erickson had a temper when we were kids. We were scared of him until like two years ago (he is an extremely nice dude, btw). Frontside 5-0. Neal Erickson switch frontside crook (!!!) in a backwards Supernatural flexfit hat. Seth McCallum gaps out to front board on a ledge that a few people have now stepped to, but Seth was the first. Thanks for letting us share these photos Damian!